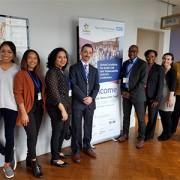 From left to right: Lisa Thaniel, Ph.D., Brittany Moffitt, Deepika Darbara, M.D., Steven Hardy, Ph.D., Andrew Campbell, M.D., Barbara Speller-Brown, DNP, Stefanie Margulies and Karen Smith-Wong all represented Children’s National at the ASCAT Conference in London. 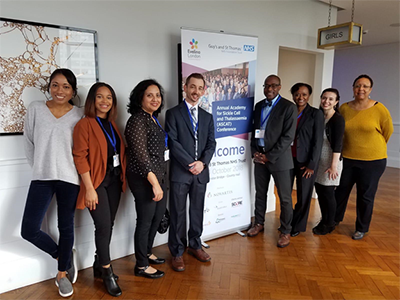 Deepika Darbari, M.D., Andrew Campbell, M.D., and Steven Hardy, Ph.D., represented Children’s National at the Annual Sickle Cell Disease and Thalassemia (ASCAT) Conference in London in late October. The theme of this year’s conference was Sickle Cell Disease and Thalassemia: Bridging the Gap in Care and Research. Dr. Darbari, a Children’s National hematologist, was the featured Grand Rounds speaker and led a pain management symposium. Dr. Darbari studies complications of sickle cell disease with an emphasis on pain. 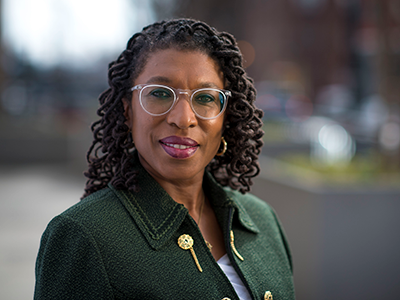 She conducts clinical and translational studies to better understand sickle cell pain and its management. She addressed the topics of pain mechanisms and phenotypes in sickle cell disease during her symposium. 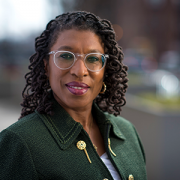 Dr. Campbell, Director of the Comprehensive Sickle Cell Disease Program at Children’s National, has served on the steering committee for this annual international conference for the past two years, working alongside colleagues from across the globe to bring together multiple experts who work with children with blood disorders. Dr. Campbell remarks, “I’m pleased to promote and be a part of [this conference] because it’s one of the best sickle cell/thalassemia conferences in the world pushing the field forward with international representation.” He spoke at the conference during Dr. Darbari’s symposium, discussing sickle cell disease pain around the globe. Dr. Hardy, a pediatric psychologist in the divisions of Blood and Marrow Transplant, Blood Disorders (Hematology) and Oncology and the Center for Cancer and Blood Disorders at Children’s National, also presented at the conference on his abstract “Computerized Working Memory Training Improves Cognition in Youth with Sickle Cell Disease.” His abstract received the Best Oral Abstract Award at the conference and was awarded a 500 pound prize. In his work at Children’s National, Dr. Hardy provides evidence-based psychological assessments and treatments for children with cancer, sickle cell disease and other blood disorders, as well as those patients undergoing bone marrow transplants. Poster presentations were also given by Barbara Speller Brown, NP, DNP, Lisa Thaniel, MSW, Ph.D., Brittany Moffitt, MSW, and Stefanie Margulies, senior clinical research coordinator, all representing Children’s National at the ASCAT Conference. The Child Health Advocacy Institute at Children’s National Health System held its first School Health Symposium, designed to strengthen relationships between the education and health care sectors. Led by Tonya Vidal Kinlow, M.P.A., vice president of Community Engagement, Advocacy and Community, Children’s National welcomed more than 150 regional health and education partners, community members and Children’s National staff to support the mission of helping kids grow up stronger. Outreach programs focused on strong community partnerships were recognized for serving diverse communities including infants and their caregivers, primary care clinicians, high school students, child care providers and teachers. Three programs were chosen as recipients for the Community Health Improvement Award through an application process where a panel of judges with expertise in public health and policy evaluated against an established criteria set. The School Health Symposium was followed by a networking reception to allow participants an opportunity to connect with colleagues and discuss the sessions.